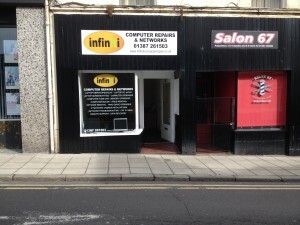 Infiniti Computer Repair are a Dumfries based computer repair shop offering solutions across a wide range of IT problems. As an Independent Expert we can offer attractive deals. We have been operating in the Dumfries area for the last 15 years. Our computer shop is located at 65 English Street, Dumfries and has excellent parking facilities across the road. It has a wheelchair accessible entrance. Infiniti Computer Repair are Laptop Repair Experts. We can service all makes of laptops and iMacs. We can supply and fit laptop screens and replace laptop power jacks. If your laptop is running slow we can restore it to its former glory. 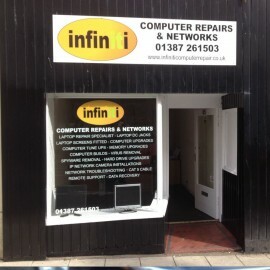 We can supply both new and refurbished computers and laptops. Our refurbished computers are inspected to a very high standard and only the best get offered for sale. That way we can offer the best guarantees on refurbished computers in the area. We sell a wide range of computer hardware and have laptop chargers in stock for most models. We support home users and small business. We can provide computer support by remote support as long as you have a working broadband connection. We can perform virus removal by this method as well as general computer servicing. Infiniti Computer Repair can supply and install all sorts of networking hardware such as router, switches, WiFi access points etc. We can provide one to one computer training. These sessions are ideal for people who may not be entirely comfortable working their computer. We can show you how to perform basic tasks and simple computer maintenance to keep your pc running smoothly. We can answer and assist you with any questions that you may have. As an independent store we are not tied down to any particular product so we can always offer attractive deals.